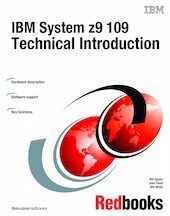 This IBM Redbooks publication introduces the IBM System z9 109 (z9-109), which offers a continuation of the IBM scalable mainframe servers. The z9-109 server is based on z/Architecture and provides extensions to the architecture. In addition to increased performance and expansion options, particular emphasis has been placed on the integration of the z9-109 into a complete system and software environment. This document provides basic information about new hardware functions and features, associated software support, and migration considerations. It is intended for systems engineers, hardware planners, and anyone else needing to understand the new z9-109 system elements and plan for their usage. This document is not intended as an introduction to mainframes. Readers are expected to be generally familiar with current zSeries technology and terminology.